The discoveries in Vanikoro encouraged renewed interest in other members of the expedition, notably, La Pérouse's second-in-command, and friend ("mon vicaire"), the commander of the Astrolabe, Paul-Antoine-Marie Fleuriot de Langle. Jean Claude Thomas, a local historian in Langle's birthplace, Quemper-Guezennec in Brittany, recounts how in September 2003, he was telephoned from distant Nomea by Jean Gillou of the Association Salomon, with a request for information. This sparked off a campaign to secure recognition for Langle, an "oublié de l'histoire", which culminated on 3rd July 2004 in the inauguration of a memorial stele. 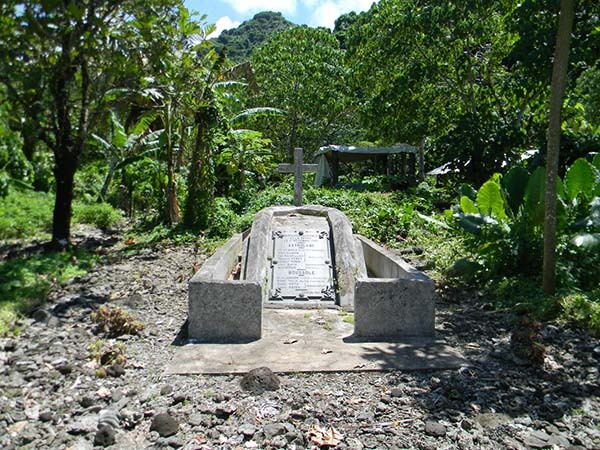 Langle's death at the hands of natives in Samoa in December 1787 cast a sombre shadow over the final months of the voyage, eclipsed only by the final catastrophe that engulfed the whole expedition. On 6th December 1787 La Pérouse came with sight of easternmost of the Samoan Islands, which Bougainville had sailed past nineteen years earlier and call the "Îles des Navigateurs". The two ships skirted the northern coast of "Opoun"(T'au) and passed through the channel between it an Olosega to the northwest on 7th December. Canoes came out to barter and La Pérouse also observed natives on the west coast of T'au who appeared well-disposed. Having sailed round the south coast of Olosega, they then headed west, to where the island of Tutuila (La Pérouse's "Maouna") was known to lie. 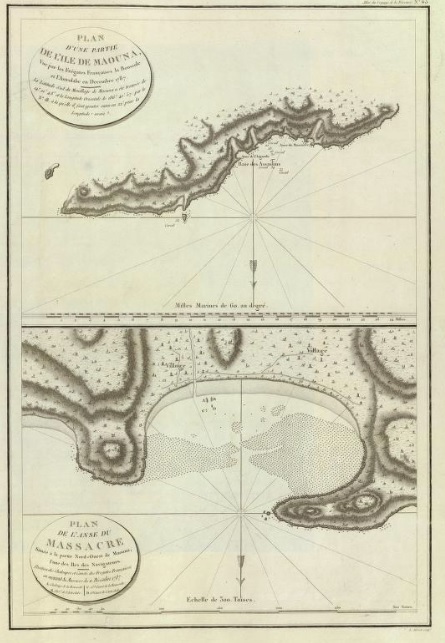 The ships approached the island's northern point, Matalia Point, late on 8th December and on the following day anchored off Fagasa Bay on a coral bank in the open sea about a mile from the shore. They had been continuously at sea for twenty-four days, and were seriously fatigued due to the heat and lack of wind which they had struggled against since the Siberia. The shore appeared inviting, with its promise of fresh supplies. At nightfall Langle went out with three armed boats to investigate a creek where he thought they might be able to replenish the water supplies of the two ships. He was unable to make an assessment as it was high tide, but the party was greeted with friendly gestures from the natives and returned to the ship in good spirits. The next day, at dawn, a large number of native canoes appeared around the frigates and offered to trade fruit in exchange for glass beads and cloth. The goods were lowered in baskets; as a measure of security, the natives were not allowed on board. Since the ships were still becalmed La Pérouse decided to go ahead with procuring water. De Clonard and de Monti were ordered to take boats into Fagasa Bay and there were plenty of volunteers eagar to join the "corvée d'eau". La Pérouse himself followed in his pinnacle. Order was restored but, as the sailors finished filling their barrels, an ominous incident occurred. Some of the natives began to act aggressively. One of their number climbed into the longboat and set about a sailor with a mallet. La Pérouse acted quickly and had four of the strongest sailors throw the man into the sea. He also had three pigeons shot in flight to demonstrate the power of their firearms, but this show seemed only to make the natives more agitated. Finally at midday, despite the numerous canoes which blocked their way, the boats made their way back safely to the ship. La Pérouse himself remained behind and was reassured by his reception at the nearby village, where he was invited him into houses, idyllically surrounded by trees laden with fresh fruit. He mused on the beauty of the place. On his return to the Boussole, he found a Chief and seven other men on board to whom he gave gifts. The expedition was delayed by a storm and it was not until the morning of 11th December that the new corvée d'eau got under way. Death of Langle, illustration from Léon Guérin, Belin-Leprieur & Morizot Les Navigateurs français, 1846. Both ships sent their longboat and barge. "Every person who had any symptoms of scurvy" was sent as part of the party. Among the contingent from the Bousolle were Lamanon, the geologist and Colinet, the gardener, who was ill at the time. The Astrolabe's longboat, under the command of midshipman Gobien, had on board the botanist La Martinière, Lavaux, the ship's surgeon and the chaplain père Receveur. 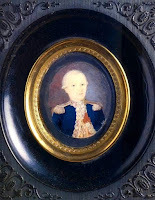 Lieutenant de Vaujuas, a convalescent, recounted that he was endused to go in Langle's barge. "by way of taking the air on shore" The boats were armed with muskets and six swivel guns mounted on the longboats. Sixty-one men in all, "the best of our hands". They arrived about half-past-one. They found that the low tide made access more difficult. Cove now filled with coral leaving only a narrow channel to manoeuvre through. Left the barges beyond the reef. To the concern of La Pérouse, the creek was out of view of the frigates at anchor. The marines and sailors had to unload the barrels in shallow water; primers of several muskets got wet and were rendered unusable. Meanwhile hundreds of natives gathered on the bank. Converged from other parts of the island.. According to lieutenant Vaujuas, several young girls offered themselves "in a most indecent manner" and were "not universally rejected"
The crowd was now joined by a group of more agressive individuals. Canoes who had been trading with the ships had filled the bay, taking the number of natives to well over a thousand. Langle judged the situation to be potentially dangerous and, to appease the crowd, had beads distributed to those he thought were the leaders; Vaujuas thought it possible he had excited jealousies by this act. Finally, at about three o'clock, with the casks filled, he gave the signal to return, but the low tide made it impossible for them to embark; the natives grabbed the cables and tried to prevent them hauling in their anchors. Started to throw stones. De Langle, stationed in the bow of his longboat, had several warning shots fired into the air. "If the fear of commencing hostilities and being accused of barbarity had not checked M. de Langle, he would unquestionably have ordered a general discharge of his swivels and musketry, which no doubt would have dispersed the mob, but he flattered himself that he could check them without shedding blood, and he fell a victim to his humanity" (p.136). Langle hit by stones and set upon; others received severe wounds; able to swim between the longboats and make for the barges. Forty-nine men out of sixty-one were saved; among the dead also was Lamanon, the famous physician. On board the ships, there was an explosion of anger; many wanted to sink the canoes which still surrounded them, but La Pérouse mastered himself sufficiently to prevent the massacre of innocent individuals. The officers from the landing party advised strongly against attempting to land. In the end he contented himself with firing a cannon into the water which put up a great splash and scattered the canoes which congregated around the frigates. 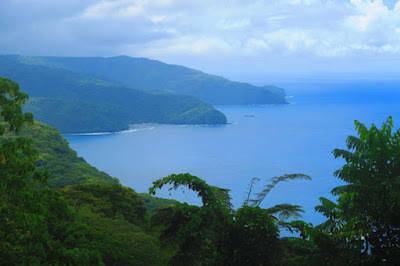 In a letter to Fleuriau, written from Botany Bay on 7th Febuary1788, La Pérouse estimated that the incident had also cost the lives of thirty Samoans. China porcelain plate with the arms of Fleuriot de Langle and his wife Georgette de Kerouartz, Musée National de la Marine. 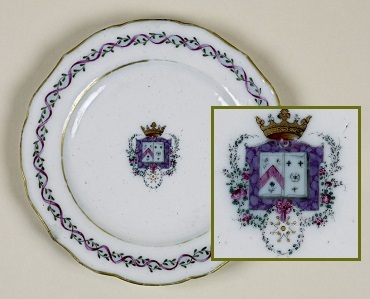 Part of a service commissioned in the course of the voyage and set back directly to France. In 1882 a Marist missionary on the island, Father Julien Vidal, was told by an old man that the victims had been buried at the site of the massacre. Vidal eventually discovered the exact location, under a "red oak", and had a wooden cross erected on the spot. In July 1884 a plaque was ceremonially erected with the names of the victims. The monument has subsequently been added to and repaired on a number of occasions, the latest in 2006. In 1887 the remains of "the white chief" (a few fragments of skull and leg bones) were relinquished to a local missionary and shipped back to France, where they were interred with full military honours in the church of St. Louis in Brest. This church was destroyed during the Second World War, but the urn containing the remains was rescued. It is not quite clear where they now are - the commemorative plaque has been replaced in the rebuilt church, but, according to John Dunmore, the cask containing the relics was relocated to the chapel of the École navale in Brest. Here is a picture of the inauguration of the memorial in Quemper Guézennec in July 2004. At the same time the public gardens next to the church was renamed Jardin Fleuriot de Langle. The commemoration was organised by the Association Racines et Patrimoine, president Jean Claude Thomas and financed by the local municipality. Alain Conan and Jean Gillou of the Association Salomon were among those who attended. The present monument dates from about 1900. Splendidly decorated "Massacre Bay Tour" bus. M Boutin and Mouton were sent with my long-boat and barge to the Astrolabe, to put themselves under the command of M de Langle. Every person that had any symptoms of scurvy, was sent in the boats, with six marines armed, having the master at arms at their head. In the two boats were eight and twenty men, and about twenty empty casks, intended to be filled with water. MM. de Lamanon and Colinet, though ill, were of the number. M. de Vaujuas, a convalescent, accompanied M. de Langle in his barge. M Gobien, a midshipman, had the command of the Astrolabe's long-boat; and M. de la Martinière and Lavaux, with father Receveur, made part of the thirty-three persons who went from that ship. The best of our hands were among the sixty-one persons who went on shore on this occasion. M de Langle armed all his people with muskets and cutlasses, and six swivels were mounted on the long-boats. I had left it entirely to himself to provide as he might think necessary for his safety. Our certainty that we had had no dispute with these people, for which they could retain any resentment, the vast number of canoes that surrounded us in the offing, and the air of gaiety and confidence that reigned in our market, tended to augment his security; and mine, I confess, could not have been greater; but it was contrary to my principles to send boats ashore, that could neither be supported nor even seen from our vessels, without extreme necessity, more particularly among a numerous people. The boats left the Astrolabe at half after twelve, and reached the watering-place in less than three quarters of an hour. But what was the surprise of all the officers, as well as of M. de Langle himself, to find, instead of a large and commodious bay, a cove filled with coral, into which there was no penetrating but by means of a winding channel not five and twenty feet wide, and where the surf broke as on a bar ! When they got in, they had not three feet of water. The long-boats grounded, and the barges remained afloat, only because they were hauled to the entrance of the pass, at some distance from the shore. Unfortunately M de Langle had reconnoitred this bay at high-water. He had not imagined that the tide rose five or six feet at these islands; and he thought his eyes deceived him. His first thought was, to quit the bay, in order to repair to that where we had already taken in water, and which had every convenience: but the air of gentleness and tranquillity that appeared among the people, who waited for him on the shore, with a vast quantity of fruits and hogs; the women and children, whom he observed among the islanders, and who are cautiously kept aloof when they have any hostile intentions, all tended to divert him from his first prudent design, which an inconceivable fatality prevented him from following. The casks from the four boats were landed with the utmost tranquillity. Excellent order was preserved on the shore by the marines, who formed a line, so as to leave a free space for the working party. But this calm was of short duration. Several canoes, after having sold their ladings of provision on board our ships, had returned ashore, and all landed in this bay, so that it was gradually filled. Instead of two hundred persons, including women and children, whom M. de Langle found when he arrived at half after one, there were ten or twelve hundred by three o'clock. The number of canoes trading with us in the morning was so great, that we scarcely noticed its diminution in the afternoon; and I congratulated myself for retaining them at the ships, hoping that our boats would be the more quiet. In this, however, I was greatly mistaken. The situation of M de Langle became every moment more embarrassing. Seconded by M. de Vaujuas, Boutin, Colinet, and Gobien, he succeeded in embarking his water: but the bay was nearly dry, and he could not hope to get his boats afloat before four o'clock. He stepped into them, however, with his detachment, and posted himself in the bow, with his musket, and his marines, forbidding them to fire till he should give orders. which happily remaining afloat, were enabled to save forty-nine men out of the sixty-one. M. Boutin had imitated all the movements, and followed all the steps of M. de Langle. His water, his people, his detachment, had been embarked at the same time, and placed in the same manner; and he occupied the same place in the bow of his long-boat. Though he dreaded the consequences of M. de Langle's moderation, he would not allow himself to fire, or to give orders to his party to do so, till his commanding officer had set him the example. It is obvious that every shot must have killed an Indian at the distance of four or five paces; but they had no time to re load. M. Boutin was likewise knocked down by a stone; fortunately, however, he fell between the two boats. In less than five minutes there was not a single man left in either of the long-boats. Each of those, who saved themselves by swimming to the barges, had several wounds, and almost all in the head; while those who had the misfortune to fall on the side next the Indians were instantly dispatched with clubs. But the islanders were so eager for plunder, that they hastened to seize on the longboats, three or four hundred getting into them, tearing up the thwarts, and stripping the inside to pieces, to search for our supposed wealth. While thus engaged, they gave themselves little concern about our barges, which afforded MM. de Vaujuas and Mouton time to save the rest of the crew, and to satisfy themselves that there were no more left in the hands of the Indians, besides those who had been massacred, and killed in the water by their patows. Narrative of M. de Vaujuas. On Tuesday, the 11th December, at eleven in the morning, M. de la Pérouse sent his long-boat and barge, laden with empty casks, and a party of marines armed, to accompany an expedition under the command of M. de Langle. M. Boutin had already received instructions respecting the means of preserving order and providing for our security when the boats should land. At the same time our captain hoisted out his boats, and in like manner loaded them with casks, and armed them. At half after twelve, the ships being within three-quarters of a league of the shore, with their larboard tacks aboard, the four boats set off to take in water in a cove that had been reconnoitred by M. de Langle. This watering place was to leeward of that where we had been before, to which M. de Langle thought it preferable, because it appeared to him less inhabited, and equally commodious. The former, however, had the advantage of a more easy entrance, and sufficient depth of water for our long-boats to be in no danger of grounding. M. de Langle asked me, though I was a convalescent and weak, to accompany him, by way of taking the air on shore. He took upon himself the command of the barge, and gave that of the longboat to M. Gobien. M. Boutin commanded the long-boat, and M. Mouton the barge of the Boussole. M. Colinet and Father Receveur, both invalids, with Messrs. de Lemanon, La Martinière, and Lavaux, and several persons from both ships, were of the party; making in all, with the crews of the two barges, sixty-one in number. While on our way, we perceived with regret that a large part of the canoes which were alongside of the ships followed us, and came to the same cove: we likewise saw several of the natives from other villages going to it along the rocks which separate it from the adjacent bays. When we came to the reef which forms the cove, and which leaves only a narrow passage of a little depth for boats, we found that it was low water, and that the long-boats could not proceed into the cove without getting aground. In fact, they touched when within half a musket-shot from the shore, and we could only get them nearer by pushing them on by setting our oars to the bottom. This bay had appeared much more favourably to the captain, because when he visited it the tide was not so low. At our arrival the savages, who stood by the water-side to the number of seven or eight hundred, threw into the sea, in token of peace, several branches of the tree from which the islanders of the South Seas obtain their inebriating liquor. On landing M. de Langle gave orders that an armed marine and a seaman should be left to guard each of the boats, while the crews of the long-boats were employed in getting in the water, under the protection of a double line of fusileers, reaching from the long-boats to the watering place. The casks were filled and taken into the boats very peaceably, the islanders suffering themselves to be kept sufficiently within bounds by the armed marines. Among them were a certain number of women, and very young girls, who offered themselves to us in the most indecent manner, and their advances were not universally rejected. We saw but few children. When our business was nearly ended, the number of natives had still increased, and they became more troublesome. This circumstance induced M. de Langle to give up the design he had before entertained, of bartering for a little provision, and he gave orders to reimbark immediately; but previously (and this, I believe, was the first cause of our misfortune) he made presents of a few beads to a sort of chiefs, who had assisted in keeping the islanders a little at a distance. We were certain, however, that this kind of police was mere mockery; and if these pretended chiefs had any authority, it extended to a very small number of persons. These presents, distributed among five or six individuals, excited the discontent of all the rest; a general clamour then arose, and we were no longer able to check it. They suffered us, however, to get into our boats; but a party of the islanders followed us into the water, while the rest picked up stones on the beach. As the long-boats were aground a little from the shore, we were obliged to wade up to the middle in water to reach them, and in doing this several of the marines wetted their muskets. In this situation began the horrible scene which I am about to relate. We had scarcely gotten into the long-boats, when M. de Langle gave orders to get in the grapnel and push them off. Several of the most robust of the islanders opposed this, by holding the grapnel rope. The captain seeing this, and perceiving the tumult increase, and a few stones reach him, endeavoured to intimidate them by firing over their heads. This, far from inspiring them with fear, was the signal of a general attack. A shower of stones, thrown with equal force and quickness, poured on us. The battle commenced on both sides, and became general. Those whose muskets were in a condition to go off brought down several of these furies; but the rest were no way disturbed at it, and seemed to act with more vigour. One party approached the boats; while another, to the number of five or six hundred, kept up a terrible and fatal discharge of stones. On the first act of hostility I had leaped into the water to get to the Astrolabe's barge, which was without officers. Circumstances gave me strength for the short passage I had to make; and notwithstanding my weakness, and a few blows I received from stones at the time, I got into the barge without assistance. I saw with grief that there was scarcely a musket in it unwetted, and that all I could do was to endeavour to get her afloat on the outside of the reef as quickly as possible. The battle however continued, and the large stones thrown by the savages wounded some of us. As soon as any one that was struck fell into the sea on the side next the savages, he was immediately despatched with their clubs or paddles. M. de Langle was the first victim of the ferociousness of these barbarians, who had experienced from him nothing but benefactions. At the commencement of the attack he was knocked down bleeding from the bow of the long-boat, where he had posted himself, and fell into the water, with the master at arms and the carpenter, who were at his side. The rage with which the islanders fell upon the captain saved the two latter, who contrived to reach the barge. Those who remained in the long-boat soon shared the fate of their unfortunate commander, except a few, who were able to escape and gain the reef, whence they swam to the barges. In less than four minutes the islanders made themselves masters of both the long-boats, and I had the affliction to see our unhappy companions massacred, without being able to assist them. The Astrolabe's barge was still within the reef, and I expected every moment to see her experience the same fate as the long-boats; but the eagerness of the islanders saved her, the greater part fell upon the long-boat, the rest contented themselves with throwing stones at us. Several, however, came to wait for us in the passage, and on the reefs. Though there was a heavy swell, and the wind blew right in, we succeeded in getting out of this fatal place, in spite of their stones, and the dangerous wounds which some of us had received; and joined M. Mouton, who was out of the cove in the Boussole's barge, and who had lightened his boat by throwing overboard his water, to make room for those who could reach him. I had taken into the Astrolabe's barge Messrs. Boutin and Colinet, with several other persons. All those who escaped to the barges were more or less wounded, so that we were in a defenceless state, and it was impossible to think of re-entering into a bay from which we were extremely happy to have escaped, to make head against a thousand enraged barbarians, as this would have been to expose ourselves to inevitable death, without the least advantage. Accordingly we steered our course to return on board the two ships, which had tacked towards the offing at three o'clock, the very moment of the massacre, not even suspecting that we were in the least danger. There was a fresh breeze, and the ships were far to windward, which was an unpleasant circumstance for us, and particularly for those whose wounds required speedy dressing. At four they put about again, and stood towards the land. When we had cleared the reefs, I set the sails and hauled close to the wind in order to get off shore, throwing overboard every thing that could impede the progress of the boat, which was full of people. Happily the islanders, busied in plundering the long-boats, thought not of pursuing us. We had nothing for our defence but four or five cutlasses and a charge for two or three muskets, which were little to protect us against two or three hundred barbarians, armed with stones and clubs, and provided with light canoes, in which they might keep themselves at what distance they pleased. Some of these canoes left the bay soon after us, but they sailed along the shore, whence one of them departed to inform those which had remained alongside the ship. The people in this canoe, as they passed, had the insolence to make threatening signs to us; but my situation obliged me to suspend my vengeance, and reserve our feeble means for our own defence. When we had gained the offing, we pulled away right to windward towards the ships, hoisted a red handkerchief at the mast-head, and as we drew near fired our last three musket-shots. M. Mouton likewise made a signal for assistance with two handkerchiefs; but we were not observed till we were almost on board. The Astrolabe, the nearest of the two ships, then bore away for us, and at half-past four I put on board her those who were most severely wounded. M. Mouton did the same; and then we repaired immediately on board the Boussole, where I related to the commodore our melancholy tale. His astonishment was extreme, after the precautions his prudence had induced him to take, and the just confidence he reposed in M. de Langle, and I can compare his sorrow only to my own. This disaster recalled to our minds a lively remembrance of that of the 13th July 1786, and threw a complete gloom over our voyage. Still, however, we thought ourselves happy, that the greater part of those who went on shore were saved; since, if eagerness for plunder had not stopped, or for a moment called off the rage of the savages, not one of us could have escaped. It is impossible, to express the feelings excited by this fatal event on board the two ships. The death of M. de Langle, who enjoyed the confidence and friendship of his crew, threw every person belonging to the Astrolabe into the utmost consternation. Those islanders who were alongside when I arrived, and knew, nothing of the affair, were on the point of being sacrificed to the vengeance of our seamen, which we had the utmost difficulty to restrain. The general affliction that prevailed on board was the noblest funeral panegyric that could be made of the captain. For my part, I lost in him a friend, rather than a commanding officer; and the concern he expressed for my welfare will lead me to regret him as long as I have breath: too happy, could I have testified my attachment and gratitude by sacrificing my life for his! But this brave officer, more exposed than the rest, was the first that fell a prey to the ferocious beasts by whom we were attacked. In the state of weakness in which I was left by my convalescence, I had gone ashore without arms, and under the protection of others; and when I reached the barge all our ammunition was expended or wetted, so that unhappily I could only give orders of too little efficacy. I should not do justice to those, who were so fortunate as to save themselves like me, did I neglect to add, that they behaved with all the coolness and bravery possible. Messrs. Boutin and Colinet, whose force of mind was unimpaired notwithstanding their severe wounds, assisted me with their counsel, which was of no small advantage; and I was ably seconded by M. Gobien, who was the last to quit the long-boat, and whose example, words, and intrepidity, contributed not a little to encourage such of the seamen as might have felt apprehension. The inferior officers, seamen, and marines, executed the orders given them with equal zeal and punctuality. M. Mouton had equal reason to be satisfied with the crew of the Boussole's barge. Every person who went ashore can testify with me, that no violence, no imprudence on our part, preceded the attack of the savages. Our Captain had issued the strictest orders to this effect, and no one had infringed them. List of the persons massacred by the savages of the Island of Maouna, the 11th December 1787. 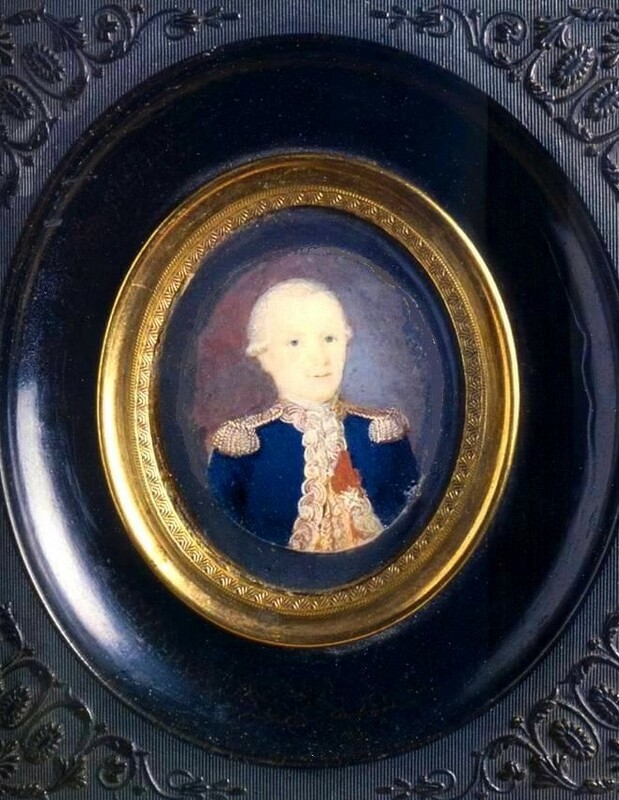 M. de Langle, post-captain, commander. Lewis David, one of the gunner's crew. M. Lamanon, natural philosopher and naturalist. Andrew Roth, of the gunner's crew. All the rest of the party were more or less wounded. A Voyage Round the World Performed in the Years 1785, 1786, 1787 and 1788 (1799), vol.2, p.134ff. Incredible research & correct that there is no Samoan side of de Lange so brutally killed.